This statement summed up the complete situation of media restriction and censorship in Venezuela. In 2007, Conatel (the Venezuelan media authority), under orders of President Chávez, refused to renew the broadcasting license of RCTV, Venezuela’s oldest private network. The authorities pointed to the channel’s alleged participation in a coup against the President in 2002. Since then, Chávez managed to obtain a stringent grasp over the other two national private mainstream networksnetworks, Venevisión and Televen. Globovisión, a local news channel, remained the stronghold of hard-line opposition news and opinion. The shutdown of RCTV was a massive scandal, and came at a high price. That same year, due to a movement that originated from the crackdown on RCTV, Chávez lost a referendum for a reform of the Constitution, one that would “consolidate” his socialist revolution. After Chávez’s death, having learned from his mentor’s mistakes, President Nicolás Maduro, did not dismantle Globovisión. Instead, the network was bought by a group close to the government, and immediately changed its editorial line in the government’s favor. Two laws have been enacted to control the media. One regulates content (which remains the gun in the drawer), and a most recent one creates CESSPA, a government agency with broad powers to censor news and spy on Venezuelans. In the past months, independent newspapers have been reporting that the foreign exchange administration has not approved the dollars needed to import the paper required to print. Some of these newspapers are on the verge of shutting down, most of them have sacrificed complete sections to stretch their chances for a few more months or weeks. Other ones have shut down altogether. National TV networks do not transmit relevant information on the protests. Their content remains as unwatchable as ever. During the evening of February 12th one of the two main outlets of news, Twitter (the other one being Facebook), could not display photos. 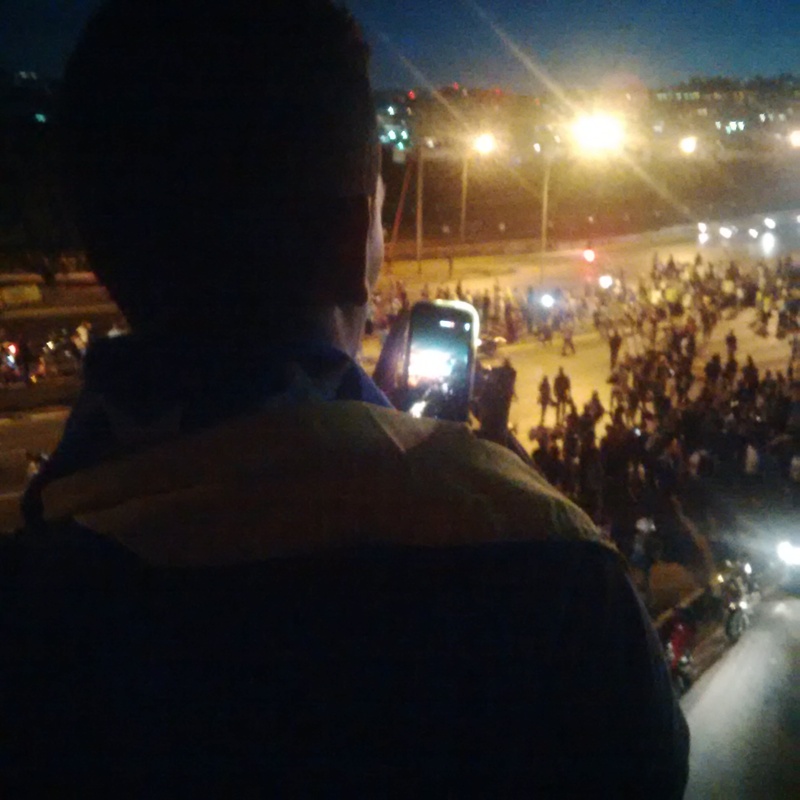 Twitter confirmed that, in fact, the Venezuelan government had caused the disruption. State owned CANTV (the telecom company that controls 95% of Internet connections in the country) denied that there had been any tampering with the system, that Twitter servers were located outside the country. Internet connection in Venezuela is among the slowest in the world. Even when Venezuelans of all economic ranges are technology freaks, the average connection speed is a paltry 1.5 Mbps. During the crisis users of the fastest connection available (8 to 10 Mbps.) have reported an excruciatingly slow 0.14 Mbps. Tachira state, which has been the subject of chavista “asymmetric war” techniques, was cut off the Internet for a whole day. La Patilla, an opposition-oriented news site, has been under attack by government-supporting hackers (?? ), and different sites which provide information on the protests or tools to bypass the blackout have been blocked. Many local journalists have been victims of aggressions by the National Guard and the Police. Some have been taken under arrest. This courtesy has been extended to foreign journalists as well. Colombian correspondent, Juan Pablo Bieri, witnessed how the National Guard tortured students while he himself was taken into custody. Vice.tv, the same guys who trolled the North Korean government, pulled out one of their journalists on assignment in Venezuela, because of too many death threats (most likely by government friendly paramilitary groups). And in a place like Venezuela, threats are to be taken, well, as promises. Aggressions don’t just come from public order forces or paramilitary groups, some come from government officials as well. CNN Español’s Patricia Janiot was kicked out of the country after a debate between chavista and opposition students (and one Mr. @juliococo) where the government supporters were left exposed as being disconnected from the country’s real problems. “There’s freedom of expression in Venezuela,” one of the chavista students said. Janiot reported she was verbally mistreated and searched for drugs as she left Maiquetia Airport. With national television under the control of the government and newspapers about to disappear, the opposition seems to be outgunned in what the President has called “mediatic wars.” There are thousands of demonstrators, however, camera ready, eager to report each detail of the conflict. This situation has also led to the digitalization of the general population, learning about proxies, and minimum hacking techniques to bypass the blackout. On the night of the 15th, a couple of days after the first peak of violence, there was, once again, nothing on National TV that would show there was any sort of public disturbance. 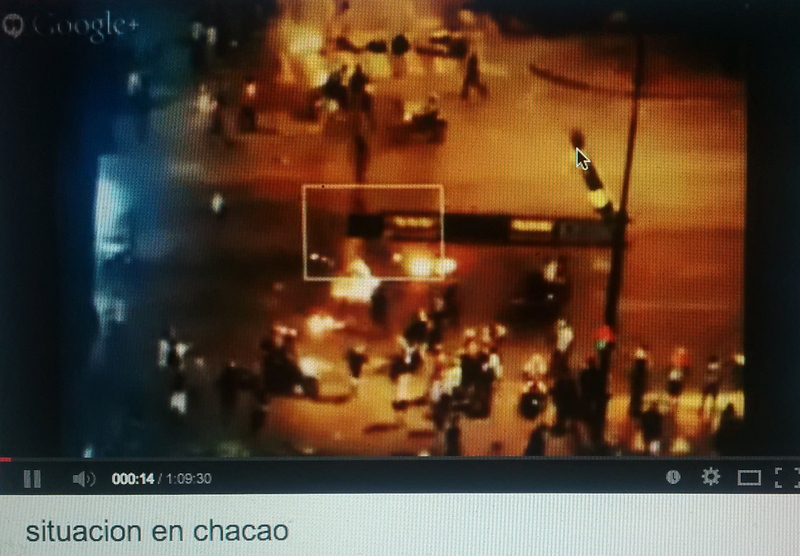 180.000 people, however, were hooked to an online streaming signal from a laptop camera pointing at a street corner of the Municipality of Chacao, where the students had been engaging the National Guard. Images resembled that of a civil war. 180.000 viewers is more rating than most public and private networks currently have. One of the most shocking aggressions happened recently in La Isabelica, Valencia. A female National Guard beat a lady in the face with her helmet while sitting on her rib cage. The event features its own photo shoot, and videos from two different angles. Of all human rights violations that have happened these days, this may be the best documented of them all. Just a few hours after the photos were posted online the aggressor was —allegedly— identified, and pictures from her Facebook profile started to pop up all over the web. In the end, you start to wonder, who is watching whom.